Please refer to our stock # 1117 when inquiring. 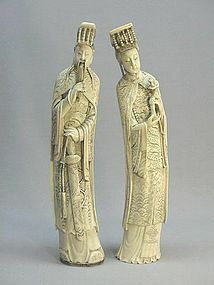 This pair of carved ivory emperor and empress are late 19th or early 20th century export pieces. The emperor is 12 ¼” high, 2 ¼” wide and 1 ¾” thick. The empress is 12 1/8” high, 2 ½” wide and 2” thick. The emperor is holding a sword and the empress is holding a Ruyi. The robes are very well carved with dragon and phoenix designs. There is honorable “Great Ming” mark on the bottom of the empress. They are in excellent condition.